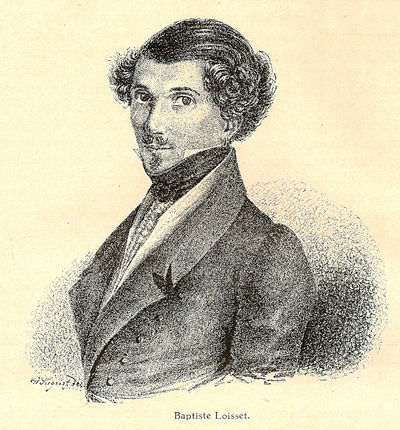 Baptiste Loisset (1797-1863) was, in the first half of the nineteenth century, one of Europe’s greatest equestrians and circus directors, a major figure in the circus world. He was one of the first horsemen to perform a somersault on horseback (on a panneau(French) A flat, padded saddle used by ballerinas on horseback., or flat saddle), and both his reputation and his knowledge of horsemanship led him to finish his brilliant career in the position of director of the royal riding academy at The Hague in the Netherlands—a country this Frenchman called home for most of his professional life. He was born Jean-Baptiste Antoine Loisset on November 28, 1797 (according to his Dutch marriage certificate) in Charleville (today Charleville-Mézières), in the department of Ardennes in France’s northeast region. However, popular biographies have placed his birth in Strasbourg, in the French province of Alsace, either on November 11 of that same year, or on August 9, 1793 (according to Signor Saltarino in his biographical dictionary, Pauvres Saltimbanques). Where those dates come from is everybody’s guess. Charleville was, then as now, an industrial city, and its economy was based upon slate and coal and the hardware needed for these industries—notably iron nails. Baptiste’s parents were François Loisset, whose occupation was recorded as "nailsmith" in official documents, and Magdaleine, née Hugot. Circus lore, however, usually makes François Loisset an officer in Napoléon’s army, and has him wounded either at the battle of Wagram (1809) or at the battle of Marengo (1800). The former assertion is not credible since the story also says that Baptiste lost his mother to yellow fever when he was four years old, and his father the following year—which would place François Loisset’s death in 1802 at the latest, seven years before the battle of Wagram. One may surmise that there has been some confusion between the elder Loissets: Baptiste’s uncle (François’s brother) served in Napoléon’s army, was wounded near Alessandria, in Piedmont, at the battle of Marengo, and is said to have settled thereafter in that Italian city.